How to Find and Remove Broken Links on a WordPress Website? 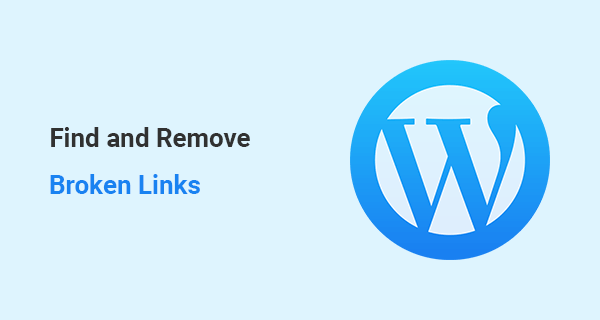 Blog » SEO » How to Find and Remove Broken Links on a WordPress Website? Fixing broken links on a WordPress website should give your website a ranking boost. This simple tutorial will help you find, remove, and fix every broken link on your WordPress website. Broken links will definitely create a bad user experience as well as it may drop your website ranking in search results. We will fix broken links using a free WordPress plugin. Check out these best WordPress SEO plugins to optimize your site further. Also, this WordPress SEO guide will help you a lot. Note: This tutorial is only for self hosted WordPress websites. A hyperlink which is either taking users to a non-existing page or either its hyperlink tag is non-functional. These sort of links are considered as broken links or dead links. These links can be internally linked or linked to an external website. Broken links leave a user dissatisfied and can cause them to leave the website. If you want to improve your bounce rate then you should look for and fix broken links as many as possible. How You Can Fix Broken Links on a WordPress Website? If you have a small website, then you can check each hyperlink individually. Browse all the pages/posts on your website and check every internal link possibly. However, I wouldn’t advise this method because as humans we are not good with such repetitive tasks. On the other hand, we can use a plugin which handles broken links much easier. Check out my recent post on how the latest link building techniques to improve your site’s ranking. Download and install the broken link checker plugin. There are many other plugins to fix this error then why use “broken link checker”? I will be using this plugin just because of its flexibility and ease of use. Important: This plugin may slow down your website if you keep it activated. Make sure to delete this plugin after fixing all the broken links on the website. Deleting the plugin will save you from slow server response time. After installing and activating the plugin. Go to the setting >> link checker page. The plugin will automatically start looking for the broken links in your website. It may take some time depending upon your site size, so wait awhile. After completing the search, this plugin will find all the broken links on your website. Go to tools >> broken links page to see actual pages which are affected by broken links. You will find plenty of options on each page. unlink: You can use the option only when the linked page has been deleted from your website and you don’t have any replacing page. Edit URL: If you recently change URLs of some older posts, you would expect to experience broken links. You can edit those changed URL links to the newer URLs. Dismiss option will basically dismiss the notification from the plugin. Recheck: Once you have updated a URL, you can click on Recheck button. It will recheck if the link is fixed or not. I hope you found this post useful. You can check out my link building services if you are interested to improve your SEO.